The only CE I purchased was Saturday Morning RPG. And that was only because it was different and cool. Carded toys that mimic GI Joe from when I was a kid? Hell yes! Now THAT is an awesome CE. But, all of the rest so far...eh. I really don't care about soundtracks. Most of these games I never even played. Do I really believe the music is going to be so memorable to me that I am going to want to break out a CD player and listen to it? Steelbook cases look cool, but they just take up space and don't conform with my red spine collection. I said it before and I will say it again, unless the CE is appealing to me I will pass and go with the standard game release. At $60 or more a pop for a game and some junk....the junk had better be good junk I am a grown man with a wife and two kids and a decent job and even I have to be very selective with my purchases to find the balance between enjoying collecting and facing poverty. Heh, I'm the exact opposite. While I can appreciate the appeal of something like SMRPG's CE, it's exactly what I don't need cluttering up my house. I used to collect action figures like crazy, but I've cut down to collecting nothing but Godzilla and extremely select superhero figures. When I say select, I mean I'm buying maybe two figures a year. I just got to a point where I don't want any more plastic bric-a-brac piling up around me. So something like SMRPG is the last thing I'm going to buy. A soundtrack and an art book, though? Now that's appealing to me. I'm a huge music and art lover. Let me rip that CD to my computer and add those tracks to my random play, put the artbook on my shelf to pore over in between games. This is the kind of thing I want. And steelbooks are my number one weakness. I HATE that the Switch shelf is 95% identical red spines with identical white lettering. It's so boring! This is why the Xenoblade Chronicles SE is the only SE I've bought so far for Switch. Great game, of course. Soundtrack, check. Artbook, check. Steelbook, check! It's perfect for me! Not trying to run your choices down at all, it just struck me as funny that two gamers in very similar situations in life have the exact opposite priorities about their collections. You're correct on what you say. They aren't forcing anyone. I guess it's just that collector in me who WANTS it but can't afford it. $30 plus shipping for a game is definitely doable every two weeks. Honestly that's awesome considering most retail games are $60. Maybe I'm just frustrated at what all is going on in my personal life that it makes it more difficult to collect. But hey, at least I'll have the LRG games out the way and not pay double or more years down the road! When is Mario Rabbits Gold Edition being physically released? June 29th, but it's only Mario + Rabbids packaged with a DLC code for the season pass. You could just go buy M+R now, and avoid that awful gold label on top of an otherwise nice box art. P.S. - it looks like Nicalis will be using the Japanese box art for the 2nd print run of Cave Story+. I think the way they are doing things are fine. I mean LRG is not forcing you to buy a CE (thankfully) to get the game. They are giving the option of game only or CE. They can do it for every game for all I care. Even if it is taking them a day to sell through....it is a day. Think about that for a moment. I can still buy the Fire Emblem CE at Best Buy. Granted the production numbers are vastly different and not as limited as LRG's CE's, but I don't think it concerns them in the slightest that it took 24 hours to sell out of their latest CE versus 30 minutes on others. As a business as long as you sell out that is a great thing...and as long as you sell out you will continue to use that business model. I suspect CE versions of every game going forward to continue to happen...until they get to a point where they just do not sell and have to go on clearance to clear out. If that happens the business model will change. I prefer the way things are personally. With the CE's being the "desirable" versions, the standard editions are open pre-order and giving us two weeks to get them. That's great and basically guarantees I will be able to get a physical copy of ever game they release with no headaches. I mean, if you work and have a steady income there is no reason why anybody can't do this given the amount of time you have and the relatively inexpensive (usually $29.99) cost of the game only copy. ...so, you're likely right - so long as they continue to sell-out at all, they will very likely continue making them. Why not? It's free money for them, it satisfies a particular segment of their client base, and there is no harm being done by selling them. My only REAL gripe with them, is their release cycle - I honestly cannot keep up with this every-two-weeks stuff, especially with the CEs. But I don't see that changing either - unless their OVERALL numbers are dropping, too which is quite possible. The question is - is the fact that it took 24hrs for that CE to sell-out a symptom of the CEs only? Or, is it systemic and their sell-through rate for BOTH the standard and CEs are down significantly... ...because that's the only thing that would really force them to change their model. I am definitely not saying they need to end the CE, but what they've offered is lackluster in a good sum. Thankfully I made the active decision to purely be a standard order. However, there is quite a few who made it their goal to buy the CE, and they feel cheapened if they don't see it sell out fast, leaving them with the idea that the CE isn't as prestigious as others. I'm not collecting every game, however I do prefer physical games to digital, so if it's a game I like (Thimbleweed, Flinthook and Slime-san) I'll grab em. If it's a game I reeeally like, then I'll grab the limited. Thimbleweed Park and Thumper (when it releases). Oh and Yooka-Laylee too. I am not even remotely interested in Night Trap. It was naff in '92. It's probably aged like milk. I know people hate on GameStop but I shop there and pre-order as well. With all this talk of GsmeStop being bought out or who knows what, I'm worried about my pre-orders. Will I lose my money? Do I get refunded? Will I even gety games? I feel I'll know closer to when whatever happens, but I don't want to wait too late and lose out my money. I've got quite a fee reserved and can't afford to lose it 100%. If you don’t want to risk losing it use it but rarely are the rewards programs zero out right away. As far as pre-orders I thought GameStop doesn’t charge until they ship unless you put $5 down on a preorder. I don’t preorder at GameStop unless it’s an exclusive however, I don’t think. You should worry at this point. Yeah I was talking about pre-orders. You put $5 minimum down, unless it's a CE. For instance, my CE Octopath cost me $25 minimum to put down. I know I shouldn't worry too much cause I know a lot of people have pre-orders as well, and if they just messed everyone over, man, talk about some you know what going down. It does make me nervous, though. Unless it's a GameStop exclusive, some may wish to start to pre-order with another company. With them exploring being bought-out/sold, who knows how much a guarantee they will give a pre-orders. @Belexes - It is bitter sweet victory for gamers. Cause if they go down the drain, it means there is no venue for them to change and be better as a game store, especially since they became the monster they are by buying out other stores. They are the monopoly, they didn't get bad and successful at the same time. On that same note, whoever buys them out may have more possessive measures they want to consider for the consumer end. With the digital media on the rise and companies like Activision and EA looking at cleaver control tactics, we may see a much bigger monster come from this. For those of you getting Wolfenstein II, don’t forget about the Switch cover! Also, my copy of Yoku’s has been updated to arrive this Thursday from Amazon. Pretty pricey week between De Blob, Crash, Wolfenstein, and now Yoku arriving! Oh well; at least it’s my birthday on Saturday, so I’ll use that as my excuse lol. 31; ugh....I feel so old. @Belexes - It is bitter sweet victory for gamers. Cause if they go down the drain, it means there is no venue for them to change and be better as a game store, especially since they became the monster they are by buying out other stores. They have had years to be a better game store and appear to be at the end of their rope exploring buy-out options. Last resort stuff. Their business tactics to me were always to satisfy the bottom line and did not have gamers' best interest's in mind. Viable online competition with Amazon is taking its toll as well. I was in a GS a couple weeks ago to browse and the place looks like a Hot Topic with the store being 80% merchandise and 20% games. I didn't go in looking for a plush or lunch box. SMH. @Belexes - Not saying you're wrong, but it is on point actually. However, investors encourage the fastest return of their money, changing things usually means long return waits if the change is even remotely successful. That being said, quitting before you can better yourself is a recipe to fail forever. I like my options, as toxic as some are, to be there in case one shifts for the better and another does not. If we're left with just Amazon (theoretically), that can get sour really quickly if we have no other choices. Imagine if Xbox One was the ONLY console coming out when they told everyone no more used games. Know that Sony had the same bad idea and changed it by E3, and MS had to follow. Just got my Ys VIII LE from NIS America. But I won't crack it open until I get through The Lost Child. Also, Amazon notified me that Yoku's Island Express is back in stock and will arrive Thursday. And Amazon has new listings. Candle: The Power of the Flame is open to preorders on Amazon NA. Moonlighter is open to preorders on Amazon NA. Pre-Ordered and Pre-Ordered! Thank you, sir! PAL version of Flashback arrived today. Very excited! Haven't had a chance to open and check it out yet. 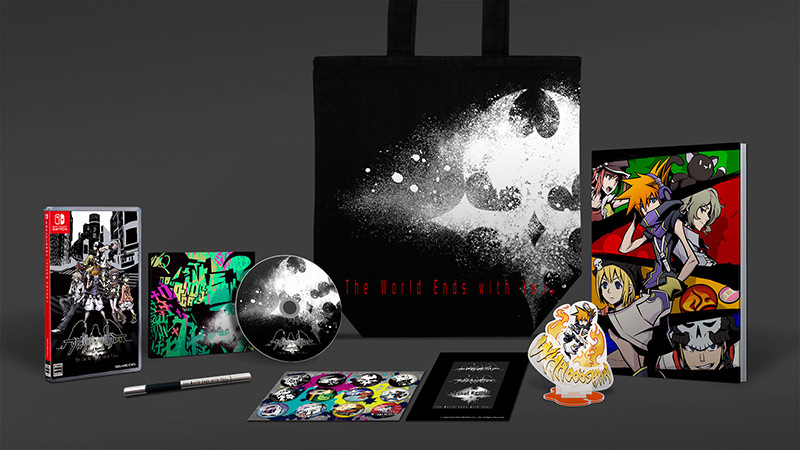 Looking at the limited edition for The World Ends With You, I'm not sure I want it. The asking price is a lot of money for some lackluster swag, imo. What does everyone think? Is this worth $155? I say, "no".